What a joyous celebration a wedding can be! We want to help make yours special, which is why we offer the information and assistance we can to help you take best advantage of our beautiful, antique church located on the Bedford Town Common. Thanks to its layout and design, which includes a relatively recent addition, we think you’ll find our building offers both flexibility and function indoors and out available in packages that can be tailored to meet your needs. For more information review the general policies and guidelines included here, or contact the church office (781-275-7994, office@uubedford.org). Contact the church office (office@uubedford.org or 781-275-7994) or come by on a weekday between 9:00 a.m. and 4:00 p.m. and speak with the office staff about the availability of the building on the proposed date of your event. If one of our ministers will be officiating, it will be necessary to check their availability for the desired date. After settling on a date, an application must be completed (download at the bottom of this page) and returned to the office along with a nonrefundable deposit of $50.00. Please make your check payable to First Parish in Bedford. Our senior minister, Rev. John Gibbons, and our parish minister, Rev. Annie Gonzalez Milliken, are available for officiating at weddings as their schedules permit, for both members and non-members. If they are not available, we can suggest names of other officiants who have previously performed weddings at First Parish in Bedford. Unfortunately, we cannot guarantee an available officiant—although we will make every effort to assist you. If you are using our church, but have an officiant other than one of our ministers, that officiant must receive permission from Rev. Gibbons to perform the ceremony. All couples must arrange for a prenuptial conversation with Rev. Gibbons or Rev. Gonzalez Milliken. You may call the Church Office to schedule this (at least one month in advance of the wedding day). Please note that if the officiant is an out-of-state member of the clergy, he or she must obtain a Certificate of Authorization from the Public Records Division of the Secretary of the Commonwealth prior to the ceremony. It is recommended that such an application be made well in advance of the wedding date. For more information, contact them at (617) 727-2836. It is possible for a non-minister or non-justice of the peace (such as a relative or family friend) to obtain special one-time permission to perform a marriage. For more information, contact the Governor’s Appointment Office at 617/725-4055. Fees paid to the officiant are paid directly to that person. If you are using the services of one of our ministers, the check should be made payable to Rev. John Gibbons or Rev. Annie Gonzalez Milliken. Please see the “Schedule of User Fees” below. Obtaining a marriage license is the responsibility of the wedding couple. You may apply for a license at any Town/City Hall in the state. In Bedford, applications are made at the Town Clerk’s Office in the Town Hall. Information is available on the Bedford Town Clerk’s website at https://www.bedfordma.gov/town-clerk/pages/marriage-licenses. There is a 3-day waiting period between making the application and the time you can pick up your license. You must bring your license with you at the time of the wedding rehearsal or make other acceptable arrangements with the officiant. Please be sure he or she makes a copy of the signed license and leaves the copy with the church office. The officiant will complete the license and return it to the appropriate officials. The church building and sanctuary are handicapped-accessible. There is an elevator at the Elm Street entrance to the church. The seating capacity in the sanctuary is about 200 people. If you expect more guests, chairs may be set up at the back of the sanctuary. The windows on the second floor may also be opened and more guests may be seated there. All arrangements for music are made through our organist, Robert Noble. The church office can tell you how to be in touch with Robert. First Parish has a beautiful Hook & Hastings pipe organ and a grand piano. The basic fee includes a music consultation and playing at the ceremony. If the organist is required at a rehearsal for the ceremony, there is an additional fee. Payment for these services should be made directly to the organist. When a soloist is involved, rehearsal arrangements and fees are negotiated with the organist. Should you be using an outside organist or pianist, there is a $50 courtesy fee paid to First Parish in Bedford. Arrangements for recording the ceremony are the responsibility of the wedding couple. It is up to the officiating minister to set policy as to what restrictions he/she may want to put on the photographer. It is possible to take photographs of and/or videotape the ceremony from the windows of the second floor. This vantage point provides an inconspicuous site, yet a full view of the ceremony. It is possible to arrange to have the church bell rung during or after the ceremony. Please make arrangements with the sexton at the time of the rehearsal if you would like this done. If you are going to have a receiving line and want to have it at the church, in good weather it works out nicely to have the receiving line out on the Common. In the event of bad weather, you can make arrangements with the sexton to have the receiving line inside the building. It is important that any decorations used are appropriate for the interior of our lovely sanctuary and that no damage is incurred. Please do not move or remove anything without consulting with the sexton. If special arrangements for decorating the church must be made, check with the Administrator a week in advance of the wedding date. It is the responsibility of the wedding couple to make arrangements for flowers either with a florist or some other party or individual. Large arrangements may be placed wherever you choose on the chancel—keep in mind the placement and number of wedding attendants when determining a good site for these. Flowers may also be put in the windows—there are 10 windows in our Sanctuary. It is important to consult with the Administrator when deciding on a delivery time for your flowers. If you are planning on leaving your flowers behind after the service and are willing to have them used in our Sunday morning worship service, please let the Administrator know. There are ten lanterns available for use in the windows. Please provide your own 4-inch dripless candles. The sexton will put them in place in the windows. The chimneys must be used at all times. There are four standing-candelabra available for use. It is essential that these are placed only at the front of the church where they are out of the flow of the congregants. Each candelabra has a capacity of 5 candles (not provided)—15-inch dripless candles work best. There is a long Shaker table available for use for items such as unity candles. Make arrangements with the sexton at the time of the rehearsal. Decorations may be put on the end of the pews. It is essential that they be attached with clips that florists can provide that will not lift the paint when the decorations are removed. Please do not use tacks or tape at any time or in any place. You will be billed for any damage incurred. 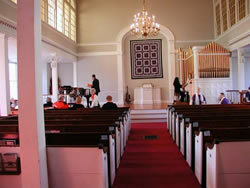 There are 7 pews on each side of the center aisle, and 8 pews on each of the exterior sides for a total of 30 pews. The church has a beautiful red carpet, so an aisle runner is not needed. However, should you wish to have one, the center aisle is 35 feet from the bottom step at the front of the sanctuary to the entrance of the sanctuary, and 46 feet from the step to the front door of the building. The church does not provide the aisle runners. The sexton will provide a cover for the heating grate in the center aisle. Sexton – It is required that a sexton be present for the rehearsal and the ceremony. A check for these services should be made out to the sexton and given to him at the time of the rehearsal. See the user fee schedule. Parking – The church has no off-street parking area of its own, so parking is all on-street. Parking may be available at the nearby Town Hall complex, which can be accessed by turning right off of Elm Street and following the road into the town parking areas. Pre-ceremony waiting site – Prior to the start of the wedding, the wedding party can retreat to the second floor lounge and rest rooms to get dressed or to await the start of the ceremony. If additional rooms are needed, there will be an extra fee and arrangements must be made in advance with the Administrator. There is no smoking allowed anywhere in the building. Food and drink are not allowed in the sanctuary. No rice, confetti, or birdseed may be thrown in the building; birdseed may be used outside the building. Activity is restricted to areas which have been reserved in advance. Common Room – a formal, elegant, high-ceilinged large hall with beautiful lighting and windows on three sides and a beautiful hardwood floor. It is suitable for a reception or sit-down dinner (capacity is about 110 people). It is located on the first floor adjacent to our new kitchen. Full Kitchen – equipped with 3 ovens, a six-burner range, refrigerator, and 3 sinks; meets the needs of most caterers. The church is not responsible for making arrangements with the caterer, but the Administrator will work out logistics with the firm of your choice. There is a dishwasher available. You must provide your own silverware, dishes and glassware. Bacon Room – a formal, carpeted, high-ceilinged, and chandeliered room overlooking the Common. It is a good site for Receiving Lines, Formal Receptions, serving hors d’oeuvres, and/or a wedding cake. It is located on the second floor. Blinn and Page Rooms – chandeliered, carpeted, formal rooms located on the second floor on either side of the Bacon Room. A good place to sit for quiet conversation and relaxation or to serve food and/or beverages. There are many other classrooms available in the building, including a nursery on the bottom floor that could be used if you would like to provide childcare for your guests. In general, the user fee for a “stand-up/finger food” reception (about 2 hours) is $300 plus sexton’s fees. A “sit-down dinner” reception lasting about 4 hours would be $500 plus the sexton’s fee. Please refer to the Schedule of User Fees below for more information, or talk to the Administrator about other arrangements and fees. Payment must be made prior to the ceremony. Checks may be given to the Sexton or Minister at the rehearsal. PLEASE NOTE: These prices include one hour for the wedding ceremony and one hour for the rehearsal. If either takes longer than one hour, the fees will be adjusted.